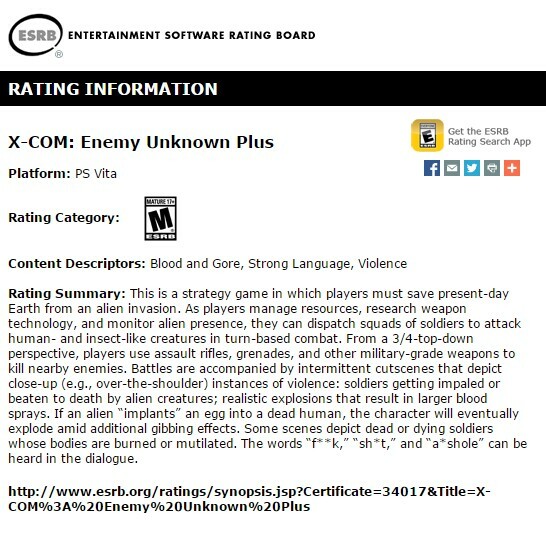 An ESRB rating has popped up for a game called XCOM: Enemy Unknown Plus for the PlayStation Vita. 2K and Firaxis appear to be taking its XCOM series on the road as an ESRB rating for a PlayStation Vita version of the game has popped up. As you can see from the screenshot of the ESRB listing, the game is called XCOM: Enemy Unknown Plus and it’s listed for Sony’s handheld and has an M rating. The rating doesn’t give us any indication of what we should expect the “Plus” to signify in its title. We would hope this means it’s the original XCOM: Enemy Unknown game as well as all downloadable content, such as XCOM: Enemy Within. XCOM: Enemy Unknown made its way to mobile devices several months after the console version was released, so a release on the Vita would be a no-brainer at this point. With the handheld's touchscreen and more traditional controls, we're sure the game will offer a variety of options for players who prefer one control type over the other. Today's news comes days after 2K and Firaxis announced they were delaying XCOM 2 from a November release to February 5, 2016. We have reached out to 2K and Firaxis regarding this story and we will update it accordingly. I keep wanting to get this for ios or android, but I keep hearing how it's a total memory hog that having too many background tasks will cause it to choke. So, I hope they get a more memory efficient port.